There’s always a perfect option. Found your favourite vinyl floor? Then you’ll no doubt want to start enjoying it as soon as possible. Let an experienced installer take care of the installation for you or roll up your sleeves… — the choice is yours. How to install your vinyl floor? Quick-Step Livyn luxury vinyl floors don’t just look natural, they are naturally easy to install, too. Depending on your specific situation, you can choose floating installation (without glue or other materials) or glue down your planks. No matter what you decide, Quick-Step vinyl is compatible with underfloor heating and can be used to finish or renovate any staircase. Opting for a floating installation? Then you’ll need to choose an underlay first. This will have a major impact on the final look, quality and comfort of your Quick-Step vinyl floor. 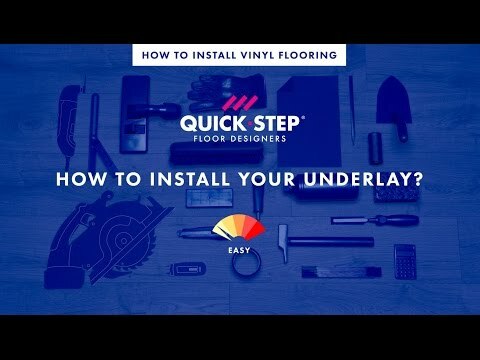 That’s why our experts recommend the dedicated Quick-Step Livyn underlays. Do you have your underlay covered? Then it’s time to get cracking — or rather: ‘clicking’. The patented 'Uniclic Multifit' for Livyn click system ensures smooth sailing when installing Livyn luxury vinyl. Thanks to the hardy tongue and groove system, you can lay the floor planks with a single ‘click’, and you won’t even need a drop of glue or any other material. Could this be any easier? STEP 1: click the panel with the long side joint against the installed plank. STEP 2: slide the planks towards each other on the short side. STEP 3: press firmly down with your thumb until you hear a ‘click’. Thanks to the patented Uniclic Multifit for Livyn click system, our vinyl floors can be installed in no time using three different installation methods, including drop-down. QUICK: the installation of vinyl boards has never been faster. EASY: use the method that works best for you and that avoids damaging your floor panels. SEAMLESS: say goodbye to open joints and to dirt that could get stuck in between. SOLID: the improved drop-down technology provides extra strength thanks to the vertical and horizontal locking. Your underlay will have a major impact on the final look, quality, and comfort of your Quick-Step vinyl floor. Quick-Step offers a range of underlays specifically selected for our Livyn vinyl floors. They are easy to install, create a level base for your new floor, and provide excellent acoustic insulation. This underlay reduces the sound heard by your neighbours to a maximum. Should only be used in combination with our rigid floor. Perfectly suitable for floor heating and cooling. Choose from a wide range of dedicated Quick-Step installation and finishing tools that will make your life a whole lot easier. The Quick-Step installation set contains everything you need to rapidly install your floor without damaging it: a tapping block, adjustable spacers (to make sure you get the expansion joints right) and a metal crowbar. Rigid and professional cutter knife with sharp concave blades for precise and steady cutting of vinyl floors. Very handy for cutting curves and shapes. Comes standard with 10 refill blades included. Tailor-made installation tool for Quick-Step Livyn floors. Allows for precise and safe cutting thanks to the extra hand protection. Easy to use both for left and right-handers. Install your vinyl floor in an easy and professional way with the handy Quick-Step Livyn installation tool, knife and Livyn Clean (750 ml). If you like things more down to earth, then our ‘glue down’ method will be right up your alley. And it’s easy too: all you need is our Glue for Quick-Step Livyn floors — specifically developed in conjunction with Soudal. What does it take to install a glue-down floor? Four things: glue, a Quick-Step glue trowel, a knife to cut the planks, and someone willing to make their flooring dream become a reality. This high-quality glue trowel is indispensable for a professional ‘glue-down’ installation of your Livyn floor. See for yourself how easy it is to install Quick-Step vinyl flooring.